On 17 and 18 October 2017 Working Group Noise met in Essen during 1,5 day. The meeting started the 17th in the afternoon with a welcome by Ms Angelika Siepman manager of the Environmental Department of the city of Essen. She welcomed the attendees on behalf of the City of Essen, which is Europe’s Green Capital this year. Quite an accomplishment, given the history of the Essen region as a centre of surface coal mining and steel industry. After the decline of that kind of industry Essen developed into a financial centre with a mixture of all kinds of small and medium businesses, mainly service oriented. Essen is part of the Ruhr Metropolis; with 5.1 million inhabitants the third largest conurbation in Europe, after London and Paris. After the welcome, the approval of the agenda, the minutes of last meeting and the action list participants introduced themselve. This meeting a high number of participants was joining the meeting (including the presenters and hosts 36!). By Professor dr. Ms Susanne Moebus a presentation was given about noise and health. She clearly demonstrated the relation between social status and health. Multiple aspects influence health adversely: poverty, poor housing, unemployment, poor neighbourhood, lack of education and environmental health hazards (downwind, downstream and downhill). Recent evidence, often obtained with more sophisticated research techniques and analyses than before, corroborates earlier findings on effects of noise: noise leads to less sleep quality, to a higher risk to cardiovascular disease, to cognitive impairment, and endangers mental health. This last effect was found in a follow-up study, starting in 2000 and still in progress. One of the options for reducing adverse health effects of noise, might be soundscaping. This has to be studies further. Under the same agenda point Ms Joerdis Wothge presented the process followed to arrive at new WHO guidelines on environmental noise. First she described the scale of the problem inside the European area. In summary, at least one million healthy years of life are lost due to road traffic noise in Western Europe. Guidelines have to be based on scientific evidence on both health effects and effectiveness of interventions to reduce exposure and improve health. New sources (after road, aircraft and railroad noise) are wind turbine noise and leisure noise. Also the guideline groups and the main steps of the process were presented. Systematic reviews were carried out regarding: Cardiovascular diseases, effects of sleep, cognitive impairment, hearing impairment and tinnitus, diabetes and metabolic effects, adverse birth outcomes, quality of life, mental health and wellbeing, and interventions. A target audience was defined. Hopefully the full draft report with recommendations will be finalised by the end of this year or in early spring 2018. The Environmental Noise Directive (END) has to be instrumental in achieving these goals. The question is: is it? less than 50% of the required noise action plans are completed. Despite the difficulties yet to overcome, the END is regarded as fit for its purpose, because each Euro, invested in noise abatement measures, brings 29 Euros benefit in terms of saved life years. The European Commission invited EUROCITIES (WG Noise) to take part in the Noise Expert Group beyond Member States. Next meeting of the EUROCITIES Environment Forum will be in Amsterdam, 4-6 April 2018. Options for taking part in, or developing future projects with support of EUROCITIES were presented. E.g. HORIZON 2020, SC5-14-2019, SC1-BHC-28-2019 (these calls are sent to all WG Noise members). The last presentation was done by Enrico Gallo (via skype) on OPenoise. QGis is a modern geographic information system, building on older software such as GRASS or ARC. openNoise is a plugin in QGIS to calculate the sound level by road traffic at buildings. The new version has some new features and links with CNOSSOS, and is still faster than other tools. The new version has to be tested and further developed, by including reflection and 3D, and add other languages than the now available English, Italian and Spanish. The second day a joint meeting with the Working Group Waste Management was held. The presentations by representatives of Oslo, Utrecht, Florence and Essen demonstrate that most complaints centre on noise from waste collection vehicles (engine noise, driving backwards – the beeps -, compressing the waste), and the time of collection (very early or very late). Additional issues are street cleaning and emptying underground waste containers. Technical adaptations reduce the complaints/annoyance partially. Waste collection and street cleaning are not only an environmental, but also an occupational health hazard. Old city centres form a special challenge because of the dense population, great number of (small) businesses, narrow streets and many visitors. As a consequence cities have to develop different modes of waste collection for different areas. A list with presented noise interventions will be drafted soon by WG Noise. 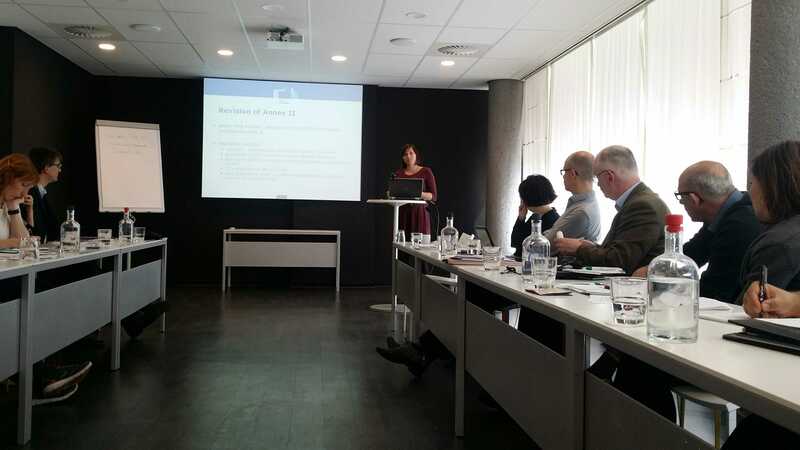 By Ms Claire Phuelpin (BAFU) the provisional outcomes of a questionnaire survey about noise and vibrations from construction sites were presented. The goal was, to assemble an overview of the politics and good practices in handling construction noise and vibrations in Europe. Sixteen authorities (national, regional, and local) answered the questionnaire. Most have binding regulations, but some have only guidelines, or only inform the public. Good practices include both technical and operational measures. Some authorities confine regulations only to the permission stage, others carry out inspections during the construction period, mainly if complaints are received. Traffic towards and away from the construction site was seldom taken into account. No “outstanding” good practices were identified; it is a matter of combining different measures. Possibilities of 3D-printing on the construction site and compensation measures were discussed. In Utrecht pile driving is prohibited, only drilling or pushing piles is allowed. A recall will be send out to all EUROCITIES members to fill out the questionnaire. comparative calculations between CNOSSOS-DE and national methods. Next to Germany also Belgium and the Netherlands are testing CNOSSOS, and Finland will be testing soon. This will be on the agenda during next meeting. After this, Ms Angelika Siepmann presented the definition and selection process of quiet areas in Essen. Most permanent noise sources are included in thev selection process, but not festivals because their limited time consumption. At the end of 2014 quiet areas were provisionally determined in a total of 85 km2, but the refugee crisis made a revision necessary, and on 27.09.2017 the council decided on a size of 62,3 km2. The quiet areas are protected by the city of Essen, but this might eventually be overruled by third parties. Ms Raffaella Bellomini presented the LIFE MONZA project. This project aims to define a guideline describing a procedure applicable in different contexts for the definition, the identification and the management of a Noise Low Emission Zone.. In the project will be implemented and tested intervention techniques strongly involving the population. Within the project activities, implementation and testing of a new low noise monitoring system will be carried out and tested in the pilot area in the long period, also after the project’s end. By Mr Martin Drepps tramway noise was presented. The so called Ruhrbahn has been equipped a number of trams with a device that lubricated the rails in order to reduce squealing. The lubricant works for about four hours, is non-toxic, does not endanger two-wheeled vehicles (sliding) and is environmental friendly. After his presentation a vist was brought to the rail top factory. Ms Angelika Siepmann presented the experiences of Essen with quiet areas. Essen serves as a pilot city in the Nordrhein-Westfalen region for developing a device to enhance public participation in developing Noise Action Plans, with the use of modern communication channels. In order to involves many people (also the non-organised) as possible. The first results are positive. A similar project was running in Berlin and was presented during the Lyon meeting. Dublin is busy with the 3rd round and is helping the whole country in meeting the requirements of the END. Produced noise maps, noise action plans and tools for traffic management. Plans to build a second runway at Dublin Airport causes much debate. Florence will complete the 3rd round of mapping this year. Many changes are going on: a new tramway line, and a change in the direction of the runways of Florence airport. Milan is no longer competent authority; the province of Lombardy took over. This includes 20 municipalities. The 3rd round is late. Due to the fact that the Lombardy authorities still has to decide who gets the work. Gothenburg reported some delay but the maps will probably be finalised this year, and the NAP’s in 2018. Many construction works, that will go on until 2010, cause many changes. Nacka has no obligations to comply to the END because the agglomeration counts less than 100.000 inhabitants, but still the city want to develop noise maps and NAPs. In Switzerland the definition of agglomerations has changed, but still work will be completed in time. Paris/Bruitparif has nearly finalised the noise maps for the whole agglomeration (over 10 million inhabitants), and NAPs will be finished before summer 2018. Noise monitoring systems are tested, and measurements are combined with modelling. The Grand Paris Express (a new high capacity automatic metro bypass) implies many construction sites. In The Hague the maps of the 3rd round will probably be approved within weeks. They will be made available to the public. After the crisis traffic has intensified again, so exposure increased, especially in the lower noise exposure regions. New NAPs will be available before summer 2018. In Oslo the maps will be approved within weeks. Noise in Oslo is increasing, causing lots of small difficulties. The Flemish government is responsible for the maps and NAPs in Antwerp. A new tramway causes extra exposure in some areas. Amsterdam has finalized the noise map 3rd round. Is shows a steep increase in exposure, partly explained by acknowledging that the old calculation model was not correct. The growth of Amsterdam Airport also leads to more (air and road) traffic. Festivals are banned from city parks towards industrial sites. Rotterdam has finalised the noise maps. Exposure levels are increased, but annoyance stayed about equal. Less quiet road surfaces are applied in high exposure zones now, and more in lower exposure zones. A first draft of the new NAP is due in November and will be finalised in March. At the moment stakeholders are being interviewed. Utrecht reported a delayed 3rd round. Recent data demonstrate a steep increase of exposure levels compared to 5 years ago. As in Amsterdam, the increase is (at least partly) due to the use of a more sophisticated model. Hopefully the maps will be finalised this year. In Essen the maps were finalised in September. New NAPs are being developed. to monitor and report the information related to other environmental parameters, such as those related to air quality, meteorological conditions, traffic, etc. to facilitate public information and communication. On 11 and 12 May Working Group Noise was hosted by the city of Zagreb. On the first day, the participants were welcomed by Ms Nevanka Preradovic head of the Energy, Environment, and Sustainable Development department of the city. Another welcome was done by Mr Zeljko Placonic of the Croation ministry of health. By Ms Sandra Hamin a brief overview was given of the noise policies of Zagreb and also policies on the central level. After the formalities like the introduction, approval of the agenda, the minutes of the previous meeting and the continuous action list a round table was organised about progress, problems encountered and solutions found during the second round of noise mapping and noise action planning and the preparations for the third round which is started now. The yield of this round was a bit scattered. Most of the cities completed the noise maps of the second round and also sent in the action plans. The implementation of the interventions and measures mentioned in the action plans is often delayed. Regarding the third round, it appeared that some cities made good progress and are on course, some are delayed and some have not started yet. Reasons for the delay or inaction seem to be diverse, mentioned was a lack of financial and human resources, lack of interest among policy makers and politicians. This is something to work on, supporting and encouraging cities to make progress and action in mitigating and reducing noise and hindrance should be part of the position of EUROCITIES’ working group noise in which it will collaborate with the European Commission and other stakeholders. The project round table was poor, just one project was presented because the presenter of the INAD and MONICA project was impeded because of illness. In the afternoon the Rimac automobile factory was visited. Rimac manufactures electric cars and electric bikes. Almost all parts of the cars and the e-bikes are produced by the factory itself. In the evening a guided city trip through Zagreb downtown was organized. The second day started with a wrap-up of the decisions and actions made during the first day. After this wrap-up, a presentation of the Zagreb masterplan on transport was given by Mr Damir Kapudjia. From 2001 until 2011 traffic increases drastically due to ecomic reasons. Zagreb promotes the use of sustainable transport and works on bike lanes these days. The number of bike lanes is increasing. The main dish during this meeting was served by Mr Marco Paviotti who presented the outcomes of the evaluation of the Environmental Noise Directive (END). He emphasized that cities should take their responsibilities and should make work of noise reduction seriously. He referred to the speech of the co-chair of the EUROCITIES Environmental Forum who stated that the END should be more muscled. Not only towards the cities and other competent bodies but also towards the other DG’s of the European Commission. The memorandum, drafted by WGN, was briefly explained by the chair. He invited the members to respond to this memorandum within one week. By Pier Saraceno the schedule for the position paper was presented and he also asked for direction. What exactly must be addressed to the European Commission and the European Parliament? He and the chair will work on the position paper, starting within two weeks. By Ms Dorota Jaroskinska, working for the World Health Organisation, the progress of the guideline noise and health was presented. This guideline is under revision now. She reported some findings of the revision process. there seems to be sufficient evidence for the health effects and long-term exposure to road traffic noise. For railway noise, this relation is somewhat poorer and for wind turbines and leisure noise, nothing can be concluded yet. She could not guarantee that the revised guideline will be published end of 2017. By Professor Ms Vesna Posloncec a thesis conducted by some of her students was presented. The student using Noise-Tube on their smartphone measured noise in Zagreb in order to compose a noise map based on noise measurements conducted with smartphones. We concluded that there was some room for improvement, although this innovative approach seems to have the future. Residents could be seen as walking sensors. Planning measures are: closing gaps between buildings, situating noise-sensitive rooms at quiet side of buildings, undertunneling a part of the ring roads, creating bypass roads, implementing low-noise road surfaces. Funding programs include granting funds in order to implement expensive noise protection measures at residential buildings (shutters, and sound insulating windows). After approval of the agenda, the minutes and the continuous action list and the introduction of all participants, the round table on noise mapping and noise action planning was held. It appeared that most of the cities already work on the 3rd round noise mapping preparations. In some cities attention is paid to city parks and restricted areas. Other cities have applied quiet road sufaces (quiet asphalt) or redeveloped urban spaces together with the introduction of the 30km zone. A few cities have problems with getting up-to-date and reliable traffic data. Tramway noise could become an important issue which implies that the NOMETRAM action could get more attention than so far. Rotterdam decided to make a separate noise map of tram noise. Antwerp will carry out a small test with CNOSSOS and UBA is also working on it. What do we consider to be the top 2 (or 3) priorities for the year to come? What can I personally do to implement these priorities? Advancing projects on non-END noise sources. The initial activity will concentrate on construction noise. Strengthening ties with WHO, so as to ensure that the updated report on noise and health from WHO is disseminated and promoted in the cities we represent. WGN will seek to influence the REFIT process to ensure that the experience of our cities is taken into account for future policy. Alongside this WGN will seek opportunities to feed into the CNOSSOS process using studies conducted by third parties. Rotterdam presented the Declaration on Better Tyres. By the vice-mayor of Rott3erdam an invitation was sent to all EUROCITIES members to sign this declaration implying that municipal fleets shall be provided with better tyres whcih are quieter, cleaner, safer and more fuel efficient. A lot of money can be saved (€36 billion/a in EU. See also www.better-tyres-now.eu . Mr Hintzsche (UBA) presented the German approach towards noise mapping, and noise action planning. 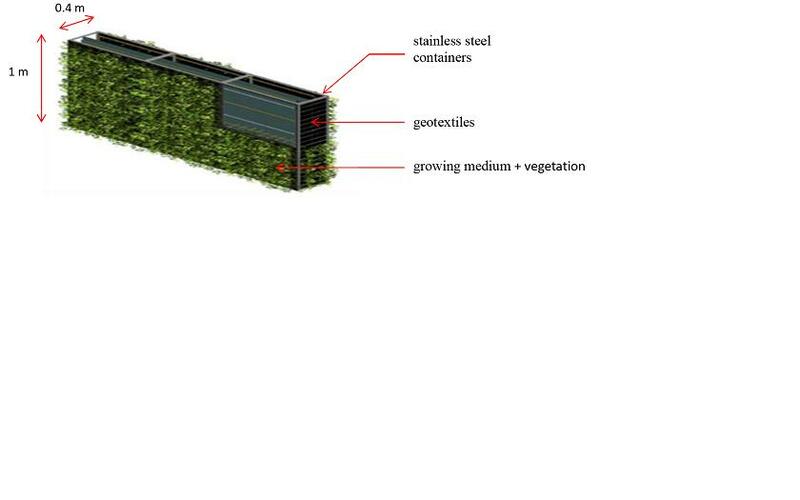 Also German noise abatement regulations are pointed out, as the general framework in which the action plans should fit.By the Dutch Road Authority (RWS) a presentation was done about a noise barrier that has bi-facial solar panels. This LIFE project called Solar-Highways. By the municipality of Milan the DYNAMAP project was presented. DYNAMAP is an project that is aimed to dynamic noise mapping, see the project website. Much can be learnt from the noise sensor network and source recognition device developed in the project by La Salle University. By DCMR/Rotterdam a lecture was given about behaviour change which was partly a recap of one of the previous studies om Gaining Political Interest. The other part was about changing residentents behaviour. All factors influencing behaviour and possible methods to influence human behaviour were explained. The last point was the next meeting which will be held in Zagreb on 11 and 12 May. Th introduction was done by Ms Sandra Hamin from Zagreb. The second day a field trip was made in Pasing a distruict of Munich. Mr Grünberger and Mr Kemmather introduced us to the technical tour. In Pasing a bypass road was created around the centre of the town (older than Munich, but in the 1930’s made part of Munich). The bypass road runs partly parallel to the already existing railway. The centre is revitalised. The bypass road attracts more vehicles than the old road through the centre, which often is the case in similar situations because of the shortened driving time. During the afternoon and the next morning the final symposium of SONORUS was held. SONORUS is a project on Urban Sound Planning. More information can be obtained here. All working documents and powerpoints can be found here. On 21 and 22 April 2016 Working Group Noise met in Ljubljana. The meeting was hosted by the Municipality of Ljubljana and the National Institute for Public Health in Slovenia (NIJ Z). After a brief welcome on behalf of EUROCITIES, the working group was welcomed by the city of Ljubljana (Mr Andrej Piltaver) and by the National Health Institute (Ms Sonja Jeram). Ljubljana, the green capital of 2016, has a lot of areas that are car free, being a pedestrian zone. The percentage of people exposed to noise levels above 55 dB decrease van 75% to 56%. After the administrative issues like approval of the agenda, the minutes and the continuous action list a round table was held. Every city reported about the progress of the noise action plan of the 2nd round and the preparation of the noise mapping 3rd round. It became clear that noise action plans often are delayed. Regarding the 3rd round it was learnt that some cities do already started with the preparation and some cities did not. A few cities see the 3rd round just as a minor update. The harmonised assessment method will not be used during the 3rd round in the cities present at the meeting. A lack of national or regional coordination and monitoring was felt in the cities. When having a national or regional group that periodically measures the progress of the END processes the compliance with the deadlines mentioned in the END would be better. It was concluded that there is still a lack of resources and political will to complete the objectives of the END on time. It was also mentioned that more interest for quiet urban areas is needed. By WHO (Ms Marie-Eve Heroux) the work in progress was reported using SKYPE. She referred to the night guidelines and the report “Burden of disease of Environmental Noise” published by WHO that reports that between 1 and 1,6 million DALY’s are lost annually in Europe. She referred also to the Parma Declaration that pays attention to young children as a vulnerable group, protecting children’s health in a changing environment. The revision of the noise guidelines that is running today comprises two tiers. The revision will be completed end 2016 or begin 2017 she reported. The survey now is in a critical stage. All articles, reports collected are put together, and now conclusions should be drawn. After the WHO presentation, a explanation was given by NIJZ (Ms Sonja Jeram) on Noise in kindergartens and elementary schools (road, railway, and recreational noise issues in Ljubljana). A lot of schools and kindergartens are exposed to noise levels above 55 dB(A) at the façade. Some even above 65 dB(A). By Amsterdam (Ms Marianne Pel) the ROAM project was reported. It was found that the availability of urban green areas did not have a significant impact on the perceived health among the interviewees. Most of the interviewees were seniors. Based on the three previous presentation a workshop was held and moderated by Ms Pel. After discussions in subgroups, a plenary report was given. Important issues regarding noise and health that were reported are low-frequency noise, building new houses in noisy areas, noise control in inner cities, competing needs in green spaces and protecting green areas. The second day started with a presentation of Gothenburg (Mr Henrik Nysted) who reported the project on controllable urban soundscapes. By installing absorbing, reflecting and shielding object, etc. in urban areas the soundscape can be improved. See also a YouTube movie and here. He also reported a small questionnaire that was done among WG Noise members. The CITI-SENSE about noise monitoring with smartphones and also adding perception and other issues to a server was presented by Ms Itziar Aspuru from TECNALIA. More information can be obtained here . Subsequently, BruitParif(Mr Piotr Gaudibert) presented the follow-up of the HARMONICA project, the RUMEUR 2.0 project (noise monitoring network employed in Ile de France region, Lille and Grand Lyon) and the KIWI project. The HARMONICA project is nominated for a LIFE award. A workshop on the strategy of WG Noise for the coming five years led by Dublin (Mr Martin Fitzpatrick). The results of this workshop will be reported later on this website. By Ljubljana presentations were given on the shunting yard (Mr Andej Piltaver) that causes a lot of noise and complaints. Interventions (barrier of 5 km length) is planned. Ms Sonja Jeram showed us an overview of all noise activities that are going on within the framework of the Green Capital. Florence called for participation in the INAD (International Noise Awareness Day 2017) and calls also for participation in the URBACT project on tram noise (NOMETRAM). By Munich (Mr Dieter Kemmather) an outlook was presented for the autumn meeting 20016 which will be held in conjunction with the closing conference of SONORUS. More information about this event will be published soon elsewhere on this website. After welcome by the chair of Working group Noise, Mr Henk Wolfert, the woorking group was welcomed by the counselor foR ecological affairs, Ms Eva Herrero. She pointed out that Barcelona is a compact city with a lot of traffic but that they work on sustainable solutions. Electrified buses and e-vehicles in use at the Barcelona Police Department. After this the usual formalities took place (agenda, minutes, action list and the introduction round). By Mr Núria Blanes the data delivering of round two was presented. She told us that they estimated that about 180 mio people in EU28 are exposed to 55 dB LDEN. Not all data was already delivered. About 75% was sent in. From the 180 mio people exposed are 125% exposed to traffic noise. It was calculated that 10.000 premature deaths occur in EU annually. Núria also referred to the state of the Environment report 2015 of EEA and the Quiet Sustainability Index. The round table on noise mapping and noise action planning showed that just a few cities have start the preparations for the 3rd round of noise mapping and most of them do not consider yet to work with, in parallel with their national or interim method, the CNOSSOS method. A few cities did not complete the second round even. A remarkable initiative was found in Dublin. The started a national steering group that can support and coordinate the activities at a local or regional level. Other competent bodies could consider or adopt this too because it was found that national coordination was lacking during both rounds. A discussion was held about a centralised approach of noise mapping (like UK) or decentralised (NL, France,..).It was concluded that an approach at local level was more fit for purpose than a centralised approach. The cities are more known with the problems at local level and where people are dealing with in daily life. An interesting discussion was held about the strategy of Working Group Noise for the coming 5 years. The remarks, suggestions etc. will be new input for further elaboration of the strategy. Just of few people wil work on it next months. Family photo Working Group Noise in Barcelona. During the announcements of EUROCITIES the chair of working group noise, Mr Henk Wolfert, was re-elected for another two years. By Mr Michael Klinkenberg a presentation was done about the urban agenda by means of skype. By Ms Laura Zapata (Barcelona) a presentation was done about recreational noise. A threefold approach is followed in Barcelona. Diagnosis (monitoring), control and prevention and third awareness. By Mr Hans van der Waal the Rotterdam monitoring project on the city hall square was presented. Based on sensors near the façades and the bars, and remote devices owners of the bars are warned that they make too much noise. The way the noise is assigned to the bars is based on a quite technical corrolation methodology. The car-free day in Paris lead to lower concentrations of air pollution and to less noise. This was presented by Mr Piotr Gaudibert (BruitParif). The noise was monitored by the sophisticated noise monitoring system iof BruitParif RUMEUR. The REMEUR monitoring systeem can be found here. The laste presentation of the first day was about new communication tools and sounscapes. This was done by Mr Fréderic Fradet. The second day started with welcome by the chair and a list of actions taken during the first day. Then, Ms Arantxa Milas (Barcelona) presented the project on Education on Noise at schools. This pilot project started 1,5 year ago a numeous parties are involved. This project is part of the International Noise Awareness Day (INAD). By Ms Núria Blanes, Mr Piotr Gaudibert and Mr Henk Wolfert a brief presentation wa sgiven about the hearing on the evaluation en review of the END. The reports discussed and the questionnaires will be disseminated. Early next year a position paper on the review and evaluation will be drafted by Working Group Noise. A brief report of the project fair held during the ICSV22 in Florence was given by Mr Henk Wolfert. The ideas of sent in and discussed are in the working documents. By Mr Hans van Leeuwen (dgmr consultancy) the first experiences with the CNOSSOS method were reported. Based on the noise map of The Hague he concluded that significant differences were found, up to 5 dB, compared with the Dutch assessment method. BY Mr Eduard Puig (Catalonia Government) some activities were presented related to Noise Awareness Day. The last presentation was done by Mr Henrik Nysted (Gothenburg); He presented the project on controolabe soundscapes and the urban sound scape agenda. He also emphasised the collaboration with the CEDR working group noise because a lot of actions, activities and interests are similar. The chair will organise a meeting with the secratary of this working group of CEDR shortly. The next meeting is not planned yet. Some mail exchange has been done between Ljubljana and the chair and the National Pubnlic Institute of Health of Slovenia. The autumn meeting is planned to be held last week of September in Munich in cionjunction with the final conference of SONORUS. Did noise maps and/or noise action plans lead to new insights into the noise problems in your city? If yes, please share. If no, why not? Did noise maps and action plans gain more political interest in noise? If yes, what factors played an important role achieving this? If not, what do you think is needed to get noise on the political agenda? When already completed the second round of noise mapping/ noise action planning: what are the (expected) results compared to the first round and are these results visible for public, politicians etc.? Ad Q 1:New insights in noise problems: no and yes. No because most cities already had a history in noise abatement before END came into existence (in general hot spots were already well known). step by step this might pave the road from complaint management to public health management. 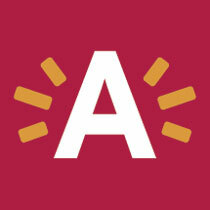 Ad Q2: More political interest? recognition of the importance of quiet urban areas. Firm guidelines by WHO, such as on air pollution, might be helpful. Politicians get bored by negative messages: turn it around: enhance attractiveness of a city and what is needed to accomplish this. Ad Q3: Comparison first and second round: better data (and more data, also covering minor roads), better calculation methods and better software in second round, in combination with changes in population and/or traffic intensity make a good comparison hardly possible. With the future introduction of CNOSSOS a new problem to compare will be introduced. About the state of the play of Noise Mapping and Noise Action Planning presented by Mrs Nuria Blanes. Ivana Juraga and Marie-Eve Heroux. Ms Blanes presented the results of the report: “Noise in Europe 2014 an EEA report, she said: Outright disappointing is the fact that the response, at the latest date the results had to be receipt by the EU, was only 44%. So the presented estimation of health impacts is only a rough estimation, which probably underestimates the real problem. Ms Juraga described the noise problem in the EU (a brief summary of the facts presented by Mrs Nuria Blanes), the EU noise policy and regulatory framework (where developing measures to reduce noise at the source is the ultimate goal), the revision of the END annexes (II, with an important role for CNOSSOS; and III, with close attention to the recent work of the WHO (expected early 2016), REFIT (evaluation of the END, expected in 2016), and finally she gave a forecast of where do we go from here. The Guidelines will provide evidence-based recommendations in order to support WHO Member States in their efforts to prevent and control exposure to excessive noise. The workshop continued the second day when Mr Henk Wolfert presented the achievements of WGN over the past years. Promising results have been accomplished on the following dossiers: Tyre regulation, tyre labelling, motorised 2 and 3 wheelers, TSI norms on rolling stock, and outdoor equipment. The END dossier is still fully in progress. The dossier on motorised vehicles still proves very tough, with relatively little progress though much effort was put into this dossier, mainly because the European automobile lobby is very strong and well organised. Instruments at the disposal of WGN are letters, position papers, statements, presentations, meetings and creating alliances, all aimed at important players in the noise field. Then he prompted the all-important question: how to improve our efforts? Analyse your playing field (know who the key players are and what their views and attitudes are), and choose your battlegrounds (be strategic, do not fight battles you are bound). focus on a limited number of dossiers. tune in with Urban Resilience Development (the capacity to survive, adapt, and grow): We aim at integrating acoustic climate objectives along with other sustainable development goals in cities planning. In line with acoustical climate urban development – or development that minimizes the harm caused by noise impacts, while maximizing the many human development opportunities presented by a more resilient future, we ask: which policies and measures should be introduced to address all dimensions of acoustical climate resilient urban development? tune in with Smart Cities. A smart city uses digital technologies to enhance performance and wellbeing, to reduce costs and resource consumption, and to engage more effectively and actively with its citizens. Key ‘smart’ sectors include transport, energy, health care, water and waste. A smart city should be able to respond faster to city and global challenges than one with a simple ‘transactional’ relationship with its citizens. In this light it would seem fruitful for members of WGN to involve providers of new technologies in noise reduction and abatement. Respect subsidiarity by developing a framework for better policy coordination and involvement of cities in policy and programme development, rather than creating new legislation for cities. Get cities around the table by involving them as partners in decisions at member state level on investment priorities, strategic policy development and programming related to Europe 2020 and the structural funds. Maintain an urban dialogue by hosting regular informal Council meetings on urban policy, and biennial urban summits at EU level gathering all government levels and urban stakeholders. Better coordinate EU policies with an urban dimension by appointing an urban envoy in the Commission to join up policies and different government levels. ad 4: Noise abatement has to be framed in more positive terminology: what are good practises to make your city more attractive? In aiming for this strategy it will be helpful to link in with the energy saving agenda’s, greening cities plans, and ideas to reduce health care costs (promote including a section on noise in the education of medical doctors). ad 5: Main dossier: END, especially Annex III, with focus on the WHO report bound to be issued in 2016. This report has to provide the momentum to raise renewed political interest. The major challenge for WGN in the coming 3 – 5 years will be to use this momentum and create more political interest, also by influencing stakeholders and creating alliances. To this purpose also the Good Practice Guide of 2006 will be scrutinised again, as will be the Nijmegen report. Also the earlier statement of WGN not to have noise limits will be revised if necessary. The assembly of ministers Health and Environment in 2017. The last presentations were held by Mr Piotr Gaudibert. The first on Health impact on Paris region: the last updated results of the quantification of healthy life years lost in the Paris region (2015). Who could be interested by a free tool to calculate automatically the DALYs in your area? And secondly the financial impact by the use of DALYs (last WHO proposal) The second presentation was the END in the Paris region: the building of the new noise maps at the scale of the Paris region for all the local authorities in charge of the implementation of the END on the territory (2 round). What is the situation for the production of noise action plan (1st round)? The last presentation he has held was about the Harmonica project: The windows program “Toots”: how to use it and produce the harmonica index? The autum meeting will be held in Barcelona. The agenda can be found elsewhere on this site. The first day was a combined meeting with working group air quality of EUROCITIES. 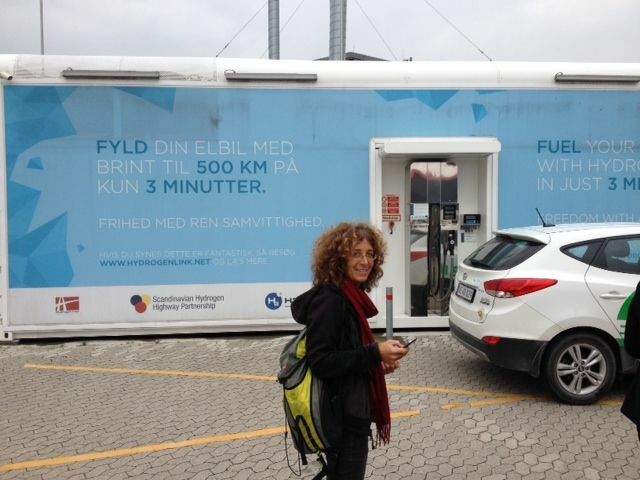 Some presentations were given about Copenhagen and also a study visit was made to a new powerplant and to a hydrogenstation aimed to fuel hydrogen cars, trucks and buses. After welcoming all members, guest speakers and the host of the meeting. The agenda is approved, as are the Report of the Antwerp meeting and the Continuous Action List. A quick roundup was given of the most salient items the Working group on air and noise have in common, which resulted in the here mentioned decision. Mr Gallo contributed to the decision by the example of Turin. This city belongs to the top-10 of most polluted cities in the world because of its position in the Po-valley (surrounded by mountains, with scarce wind and high temperatures in summer, leading to high concentrations of O3, and much thermal inversion in winter), its heavy industry (mainly vehicles, Fiat, Iveco), and the fact that cars hold an important place in the Italian way of life in general and the Turin way in particular. Automotive modal split in Turin is 70% private cars vs 30% public transport. Approved plans for improving the situation (new metro and railway lines) are slowed down by the economic crisis. Synergy air plus noise is essential to save money. Idea: solar collectors in noise barriers, and buildings with both thermal and acoustical insulation. Our host, Ms Karen Forsting told us that the goals for the action plan for road traffic are formulated in an idealistic way: a faraway horizon. But by doing so the city of Copenhagen shows a high ambition level, and the broad scope of actions clearly reflect this high ambition level. Especially the actions, partly achieved and partly ongoing, to be world’s best city for cyclists has large effects on the numbers of motorized traffic in the city. Stockholm The approved NAP is being executed. First priority is still improving windows insulation. Next to this, existing noise barriers are made more effective (longer, green, absorbent). Apart from the NAP a separate study is in preparation for identification of hotspots during the night. Problems with mapping are not yet solved: not all input data appeared to be correct. Paris: difficult process due to more than 400 administrative entities. Noise maps will be finalized in 2015. A NAP is ready, and waiting for political approval. Because the conglomerate of Paris is too late, France will have to pay a fine to the EU. Positive for the future may be, that a huge mapping operation is planned for 2015, in which practically all administrative entities will participate. Porto: A NAP was completed in 2010. A number of actions were taken. Some are already completed, some are under way. The effects of the completed actions are hard to interpret, because the Porto population has shrunken by 30.000 inhabitants over the past 10 years. Some actions are delayed because of the economic crisis. A new practical problem is that road construction gives new hotspots, because builders simply ignore (inexpensive) recommendations and guidelines. Amsterdam: 2nd round noise maps is finished. Amsterdam has some interesting new houses development sites. The NAP is very detailed for urban planning, and is integrated into the Sustainability Agenda. As a consequence noise problems have become the responsibility of other programs and persons. Synergy is sought between noise, energy saving, and air quality measures. acoustical façade insulation. This project will end this year, but probably there will be an extension in the scope of a national insulation program. At music events, bars and clubs a strict enforcement policy is maintained. A-social (noisy) behaviour, for instance by youngsters on scooters, is discourages by police actions. Hotspots from the metro and tramway are identified. Apart from the NAP a social cost – benefit analysis has been carried out earlier, and an update is in preparation. Furthermore (outside Rotterdam) some municipalities are late in delivering their duties to the EU. The national government has ordered engineering bureau to assist these municipalities with the maps and NAP’s. Of course the extra costs are for the municipalities. Utrecht is late as well. The NAP was finished before summer, but the city council only discussed it in September. At the request of the responsible alderman the original NAP was lean and mean, but the council decided that the score op the NAP should be The road maintenance department will have to consider the use of quiet road pavement when drawing up their maintenance year plan. Barcelona: 2nd round noise maps was finished last year. A NAP for a period of 10 years is carried oud. A new mobility plan, aiming at the concentration of traffic through a limited number of main arteries will be included in the NAP. Malmö: In Malmö a new super bus is introduced in order to decrease commuting by own car. Problems with vibration by this vehicle have to be solved. Turin: On the 17th of September the new NAP was approved. The ongoing actions are continued. New is €300.000 for silent surfaces. As hardly new investments can be made because of the crisis, the main focus is now on better maintenance. In the near future a new metro line will open (the existing urban railway will go underground), leading to 2 dB noise reduction on the roads of the old track. The Hague: is still working on the second NAP. Ongoing actions are realising more quiet asphalt and façade insulation. A start will be made (in the second NAP) to monitor the results of quiet asphalt. The local authorities are more interested in air quality, which results in building more charging points for electric vehicles and better bike facilities (routes and parking), which of course also has beneficial effects on traffic noise levels. Lyon: 2nd round noise maps were approved in December 2013. Now the second NAP is being worked on. Gothenburg: The second round of noise mapping is finalised except for tramway noise. The 2nd NAP was approved last February. It includes window insulation, noise abatement in kindergartens and parks, more and better public transport (busses and trams), maintenance of existing noise barriers, speed limits, bike lines and studded tyres. By Pedro Pombeiro was told that In Porto industrial and railway noise are irrelevant, while aircraft noise is only relevant in one small part of the city. The two main problems are road traffic noise and the booming night life in the city centre. The noise department is heavily understaffed with 7 technicians to manage 840 events and approximately 400 complaints a year. In 2012 a noise abatement law was put into action. As a result a conflict map for road traffic noise was developed, and a model was adopted for estimating the impact. Eight hotspots, falling under the jurisdiction of the community of Porto, were identified, along with others that fall under separate authorities. To manage the night life problems a number of measures is taken: sound limiters, strict control of closing time (04:00 h) and strict control that doors and windows of bars should be kept closed, no sound devices outdoor, higher fines, and traffic circulation curfew during weekends. But mostly negotiation is used to keep opposing parties satisfied. For road traffic the strategic planning includes: pavement improvement, velocity reduction, traffic flow reduction, and acoustic insulation. The approach to night time noise and traffic noise seems effective: the number of complaints has decreased. Ms Lykke Iversen presented COMPETT which is a Electro mobility project with participants form Norway (TOI), Austria (AEA) and Denmark (DRD). This project investigates the conditions for successful implementation of electro mobility in European cities. Mrs Iversen presented a test with 4 cars. Two electric and two normal gasoline driven cars. The measurements were carried out with the so called pass by method, during weekends at deserted parking spaces. At low speed electric cars are less noisy than gasoline driven cars. This difference disappears above approximately 30 km/h. More detail of the test can be found in WD 05.2 and on the website of COMPETT: www.compett.org. 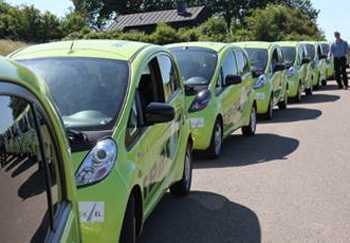 As a follow-up to the Road Noise Strategy, the Danish Ministry of the Environment, decided to make a grant of €700.000 on a pilot scheme for financial noise partnerships between municipalities and homeowners to test the feasibility of joint noise abatement projects. Experience from these partnerships show, that it does pay to put a price tag on the noise impact to raise awareness of the positive socio-economic results by reducing the noise such as increasing the value of dwellings and improving the state of public health.A point of concern is, that 25% of new houses is still built in noise levels over Lden 58 dB. Dyring the round table on projects Ms Natale and Mr Melloni presented QUADMAP’s main aimwhich is to propose a solution to overcome the lack of harmonized methodologies for QUAs. The first draft methodology (developed within QUADMAP project) has been tested in ten pilot areas selected in Florence (IT), Rotterdam (NL) and Bilbao (SP). The results will be presented during the closing conference on 19 and 20 February in Rotterdam. website QUADMAP project is http://www.quadmap.eu . On this website the guidelines can be obtained already. Up to now Amsterdam, The Hague, Antwerp, Turin, DCMR, BAFU and BruitParif confirmed their participation. More participants are welcome. Mr. Paviotti is willing to host a workshop, if WGN delivers the input and organises it. Mr Gaudibert demonstrated the usability of the HARMONICA project: http://www.noiseineu.eu/ . Please take some time to visit this site. The closing conference of this project will be on 9 December in Brussels. Mrs Natale introduced the progress of NOMETRAM. The members so far involved in this WGN subgroup are the cities of Florence, Zaragozza, Zagreb, Dublin, Rotterdam, DCMR EPA, Intersted Companies and Vie.en.Ro.Se. By means of a questionnaire the tramway noise problems will be inventoried and also possible solutions. The questionnaire will be sent again to all before the end of October. The findings of NOMETRAM will be presented during the ICSV conference in Florence, in July 2015. Ms Birgit Rasmussen demonstrated the existing jumble of sound insulation descriptors in Europe, and the necessity to attain some harmonisation in order to create a level playing field for international trade of building materials. On 24 and 25 April the Working Group Noise met in Antwerp in the Seminary Elzenveld. After welcome by the chair of WG Noise (Mr Henk Wolfert) Working Group Noise was welcomed by the council member for environment Ms Nabilla Ait Daoud. She emphasized the importance of noise and the importance of collaboration and exchange of knowledge and experiences between cities. After fulfilling some administrative duties, like approval of the agenda, acqaintance round, approval of minutes last meeting and the continuous action list, a round table on noise mapping and noise action planning was held. It was concluded that criterai on how to define hotspot is lacking and that for the second round use of better dat and other methods has led to other outcomes. Thus, a good comparison between the findings of the 1st and the 2nd round is not possible in many cities. During the INTERNOISE congresses of 2010 and 2011 some papers have been sent in on this issue of defining hotspots. A number of cities heve planned to employ quiet asphalt layers. Most of the second noise action plans are not yet approved by the cities councils and delayed. It was also noticed that residents reported that other noise sorts (neighbour noise, event noise, construction noise, et cetera) are more annoying than the noise sorts (traffic, rail, airport and industry) mapped. Tram noise is considered as extermely noisy in cities because of the squeal and the short distances to dwellings. It was decided to launch an expertgroup on this topic that will be led by Mr Sergio Luzzi. Members of this expertgroup are so far Utrecht, Florence, Rotterdam and Zagreb. After the round table Mr Joachim Scheuren presented the SONORUS project (www.fp7.sonorus.nl) which is a project aimed to learn about urban sound planning. A lot of EUROCITIES cities are involved in this project. A number of summer schools will be organised as a result of this project. After this presentation the leaflet on Quiet Road Surface was discussed. By means of a presentation done by Ms Annelien Bergiers information was handed about different quiet asphalt layers, their advantages and disadvantages. The leaflet will be published before end of this year. A separate page will be included for politicians. It ws decided to lauch an expert group on this subject, called EQUAL, that stands for Expert group QUiet Asphalt Layers). By Mr Michael Klinkenberg from the EUROCITIES office an overview was given of the LIFE funding programme. Noise is mentioned in this programme and it offers opportunities for projects for Working Group Noise and its members. A list of potential projects will be composed and dissemninated among the members of Working Group Noise. By Mr Sergio Luzzi and the chair, Mr Henk Wolfert the International Noise Awareness Day was explained. In 2017 a special large event will be organised and Mr Luzzi calls for co-organisers. By Mr Bernhard Berger an update was given on the EU legislation. Important part of this update is the REFIT programma that reviews legislation on fit for purpose. The Environmental Noise Directive is also reveiwed within this programme. CNOSSOS (Annex II of the END) is expected to be aproved in May and will enter into force end of 2014 or begin 2015. Annex III of the END is currently reviewed by WHO. WGN is invited to particiapte in some stage of this review as end-users. By Mr Johan Sliggers and Mr Enrico Gallo presentations were done about house labelling.The system in Turin is already in place. Cost Benefit Analysis on costs of different measures in €/per annoyed person like CEDR did. By the chair, MNr Henk Wolfert, an inspiring presentation was given on Urban Transport Noise and innovative solutions. SMART solutions are needed for the future. For instance, an adaptive noise barrier along railways (Kas Oosterhuis), see here. The last presentation was on healthy urbanisation by Mr Leendert de Die. The next meeting will be in Copenhagen. Agenda points are mentioned elsewhere at this blog. On 28 and 29 November 2013 Working Group Noise EUROCITIES has met in Bilbao. The meeting has been held at the beautiful Alhondiga building in the centre of Bilbao. The meeting has been held in conjunction with the Symposium on Practices on Acoustic Comfort in Urban Design (a QUADMAP event). For more information about the symposium see the QUADMAP website (www.quadmap.eu). After being welcomed by the Bilbao representatives that showed us a nice video of the city of Bilbao and some warm welcome by the director of the Public Works department the meeting could start. The video showed us how the transformation of Bilbao took and still takes place. A new airport arose, new transportation systems have been built, the famous Guggenheim museum and a lot of other developments also. After approval of the agenda, the minutes of the spring meeting in Lyon and the continuous action list attention was paid to the Leaflet on Quiet Road Surfaces 2.0. This leaflet is an update of a previous leaflet and contains the last developments in this domain. The leaflet will be reviewed by the working group and subsequently be made more accessible for policy makers and employees working at the traffic departments in our cities. Also some attention will be paid to make the leaflet more “European” because the content so far is based on experiences in The Netherlands, Belgium, Denmark, Sweden, Poland, Germany, France and Slovenia. The leaflet is expected to be published in the first quarter of 2014. The next agenda point was concerning the programme ‘Les Pierrots de la Nuit’. By the cities of Barcelona and Brussels was presented how this programme is executed in their cities. The experiences in Paris were presented by the programme manager. The name of the Brussels programme is called ‘Gentlemen Noceurs’ but is based on the same formula. The aim of the programme is to make people staying in areas with night clubs, restaurants, disco bars, café’s, et cetera aware that they could cause noise annoyance for citizens living in those areas. The approach is very friendly and creative by using mediators and ‘pierrots’, in English clowns to entice those visitors to show less noisy behaviour. It is only addressed to people that are outside the premises. The programme has many participants on board like owners of bars, local authorities and many other. The approach is a very gentle approach, a positive approach not antagonising people. Working Group Noise reacted very positive on this initiative and the progress of the programme will be followed by them. More detailed information about this project can be obtained on the website www.lespierrotsdelanuit.org, on Facebook (facebook.com/pierrotsdelanuit) and even youtube. During the evening of the first day a guided tour was done through the city of Bilbao and the evening was finalised with a diner at La Bibaina. During the second day a presentation has been held on Cost Benefit Analysis on Quiet Road Surfaces by Rotterdam/DCMR EPA. The CBA was based on DALY’s which stands for Daly Adjusted Life Years or in common words lost healthy life years. The Rotterdam exercise learnt that it is cheaper to employ quiet asphalt to reduce the noise than keeping the current situation. More information can be obtained by contacting the chair of Rotterdam (henk.wolfert@dcmr.nl). A brief summary of this exercise will become available soon and will be sent to all members of Working Group Noise. After a brief report on the progress of the QUADMAP, the QSIDE and the Harmonica projects an update was given about the CNOSSOS project by DGMR. During and after the presentation a rather heated discussion erupted whether the CNOSSOS methodology should be used for other purposes than noise mapping. Taken the END literally the common assessment method should only be mandatory for noise mapping. This means that assessment needed for spatial planning, environmental permitting, enforcement or inspection can be based on the national method. The CNOSSOS method should meet the accuracy needed to draw strategic noise maps. It is not needed to use very detailed and accurate tools for providing noise maps. We will send this signal to the so called article 13 Committee. 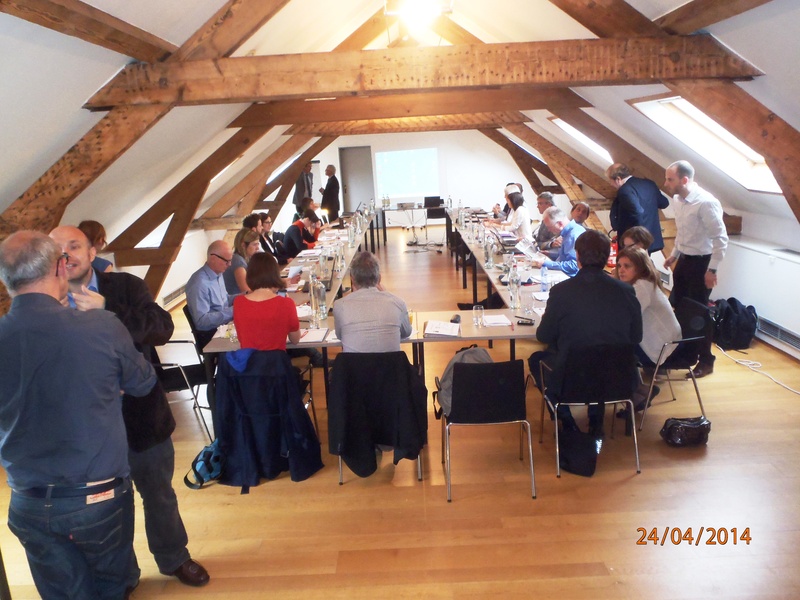 On 25 and 26 April the spring meeting of working group noise was held in Lyon. Host of the meeting was Grand Lyon communauté urbaine . The meeting was attended by 12 cities and some representatives of Grand Lyon. After the welcome by Mr Sébastien Chambe of Grand Lyon who gave an impression about the recent developments in Lyon and about a few venue’s that are currently under reconstruction in order to reach a better environmently situation, see below. Congestion is good he said meaning that avoiding environmental pollution is also a measure that can be taken. By narrowing the roads, creati ng another road profile with lanes for bikers and pedestrians cars will be discouraged to enter the city centre. There is sufficient public transport to reach the city centre. From the following presentation, by Ms Julie Vallet, it appeared that around 30% of the residents in Lyon are exposed to noise levels that are too high. Last years the volume of cars decreased due to the street narrowing. Designation of the hotspots takes place on an acoustic threshold being 68 dB Lden. After the Lyon presentation the Berlin action plan noise was presented by Ms Dorothea Salz. More than 80% of the city’s streets are 30 km streets. Berlin follows an integrated approach and has introduduced also street narrowing combined with more space for public transport, bikers and pedestrians. Berlin also has applied quiet road surfaces in a few places. Public involvement has been very succesful in Berlin. For this a marketing organisation was hired, see www.leises.berlin.de. After these two interesting presentation the representative presented some ideas about the International Noise Awareness Day (INAD). This was held on 24 april 2014 and he was wondering whether this could be held all over Europe. He asked for ideas and for support to celebrate this next year. EUROCITIES possibly can support this by means of dessiminating the ideas (channel function). After this a brief visit was brought to the Garibaldi street. One of the most auto crowded streets in Lyon but now to reconstruct in another road profile with more space for pedestrians and bikers. 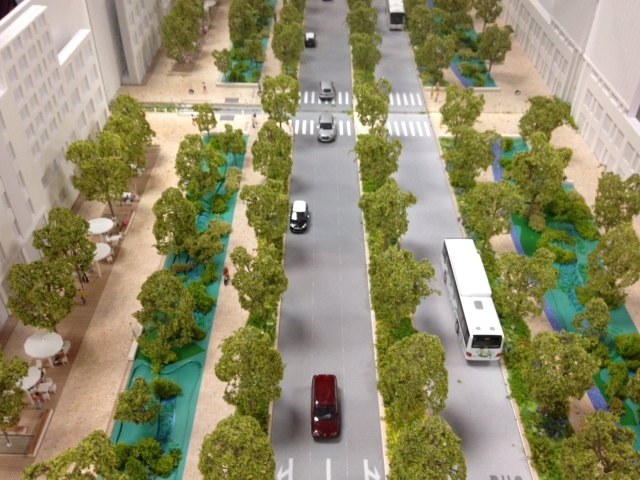 The streets reconstruction will be finalised in 2014. See also the figure which gives the future situation. It is expected that the noise levels will decrease with 3-5 dB. After the Lunch a round table on progress of noise maps and noise action plans 2nd round has been held. Most of the activities are delayed unfortunately. Partly because of the local elections that will be held next year. The impressions left behind is that the reports give a more positive view than the reports during the autumn meeting in Paris last year. By Mr Martin Fitzpatrick (Dublin) was stressed that collaboration between noise and other (environmental) field is more than needed. That pleas for a partly combined meeting during the autumn meeting in Bilbao, later this year. 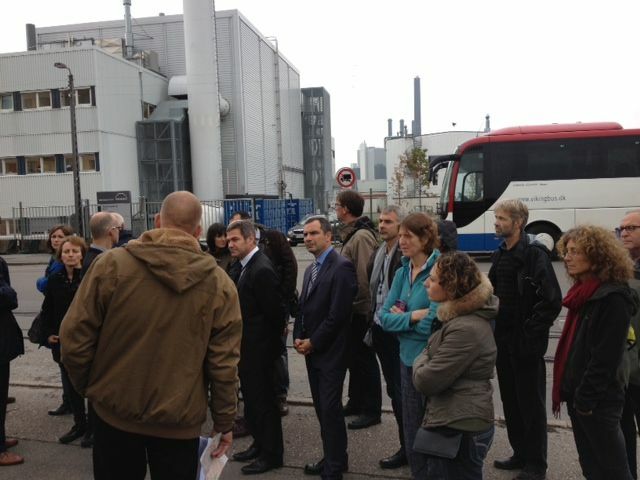 By Sébastien Carra from Acoucité a presentation of the monitoring system of Lyon was held. Lyon has 18 noise monitoring units and the system is operated by Acoucité. More information about this system can be obtained by visiting the website (www.acoucite.org). By Vincent Gissinger from Acoucité the HOSANNA project was explained and the handbook that was recently published. More information about this project can be found on the website of HOSANNA (http://www.greener-cities.eu). This project delivers measures that can be taken to mitigate the noise in urban areas and that can be defined as green. The last presentation held was about the role of sustainable public transport and sustainable public transport systems. Electric and hybrid busses, co-modality were key in his presentation. Full electric buses cannot be used yet for large distances because of the limited battery capacities. However, one is working on it by replacing batteries during stops (better place approach) and induction and conduction techniques during stops. It was concluded that the infrastructure needed for short term charging is very expensive. But it looks a bright future. In Vienna, Schiermonnikoog (NL) and Grenoble. In the evening a touristic tour was done and one of the pilots of the HARMONICA project was visited. This is a low green screen along a busy road that reduced the noise with 3-4 dB. See figure below. The second day we first brought a visit to ZAC La Buire, a former industrial area that is transformed into a mixed area wit offices, dwellings, kindergarten and school. The kindergarten can also be used as a temporary water store in case of heavy rainfalls. The offices are situated along busy roads and are provided with double or triple glazing. The form the outer ring, shielding the noise form the roads. Behind the offices, dwellings are situated and the school. In the centre the kindergarten/quiet area is situated. The noise in the middle of the area is about 15-20 dB lower than the noise along the busy streets. It a best practice of good urban planning. After this site visit the chair of Working group Noise, Mr Henk Wolfert, presented in main lines the draft Paper on Urban Transport Noise. Cities need another transport pattern and transitions toward that will go belong numerous strands. The paper will be finalised in the autumn meeting in Bilbao. The Bilbao meeting is scheduled for 28 and 29 November and probably this will be held in conjunction with an event on Quiet Areas. Half a day a meeting with working group air quality will be held. The final programme will be drafted in collaboration with Bilboa and TECNALIA. Regarding the Leaflet on Noise and Health it will be decided whether an existing document could be translated from Dutch to English. If the document is not suitable then funds are needed. Revised house rules are approved. Now the hosting city will pay the note taker (costs of travel and hotel). The progress on the motor vehicle noise regulation is reported by the chair. Now the Council Working Party is working on the dossier. See elsewhere on this weblog. Regarding the Environmental Noise Directive it is reported that no progress is found and can be expected this year. Only the CNOSSOS (common assessment methods) has some progress. By EXTRIUM a consortium is lead to work out the method. It is expected that Annex II of the END will be published (in revised form) in the mid of 2014. It is decided that the spring meeting in 2014 will be held in Antwerp. 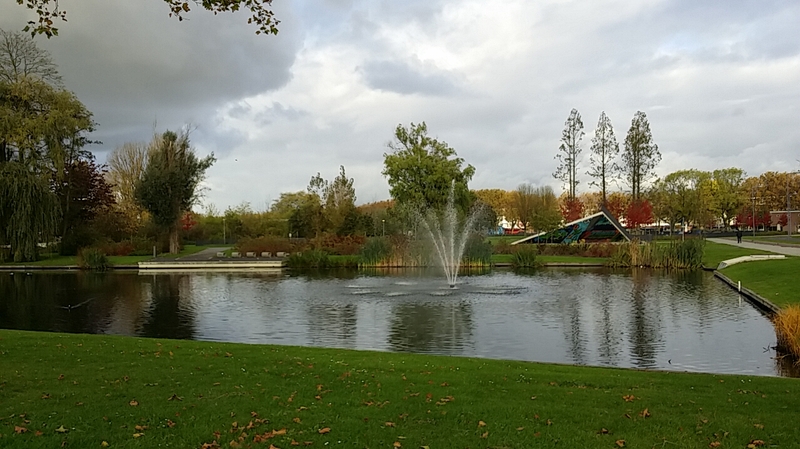 Possible dates will be negotiated with the municipality of Antwerp. By Dorothea Salz from Berlin the ongoing consultation on the TSI norm of rolling stock is explained. Berlin already has sufficient input for the passenger trains. This means that only extra information regarding the freight trains and the high speed trains is needed. Every city will determine the possibilities to deliver information and to send in a letter to the European Railway Agency. In the afternoon a visit was brought to the Berges du hone, an area on the river bank. We are still looking for some additional agenda points, but be sure we will have a full and inspiring agenda. Interested in joining our meeting? Please contact ms Patricia van Rixoort (patricia.vanrixoort@dcmr.nl) for more information or to register.